Pravaaha is conceptualized on globalization, its aftereffects on our culture and tradition. Having a potter as an exemplary victim, this film also sheds light on poverty of village craftsmen, their miserable social life, bossism of upper-class people and politics. Marappa, a potter who struggle for survival in the changed realities of life and finds its difficult to continue his age-old pottery craft as plastic articles compete and replace his clayware. His son Siddarama grows up in this unenviable environ of decadence. 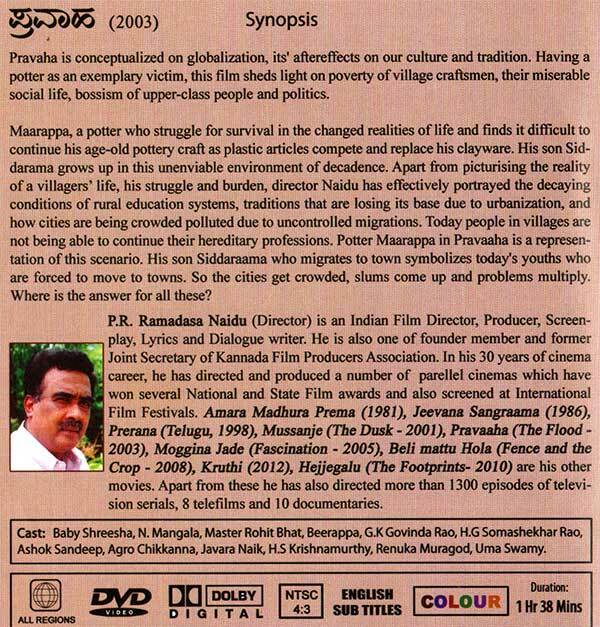 Apart from picturising the reality of a villager's life, his struggle and burden, director Naidu has effectively portrayed the decaying conditions of rural education systems, traditions that are losing its base due to urbanization, and how cities are being crowded,Acchutha Kumar and Master Rohitkumar as Marappa and Siddaramaiah in film Pravaha polluted due to uncontrolled migrations. Today people in villages are not being able to continue their hereditary professions. Potter Marappa in Pravaha is a representation of this scenario. His son Siddarama who migrates to town symbolizes today's youths who are forced to move to towns. So the cities get crowded, slums come up and problems multiply. Where is the answer for all these?